These are some of Rocky Mountaineer’s most popular Canadian Rockies train trips. Ride the tracks from Vancouver to Banff or Lake Louise on our Canadian Rockies Excursion tour, or combine several nights in Jasper, Banff and Calgary to see all the sightseeing tours, including riding on the Banff Gondola. There’s a little something for everyone when you take a Canadian Rockies train tour. Our shortest Rocky Mountaineer package has the Canadian Rockies visitor on the train for two days and one night. 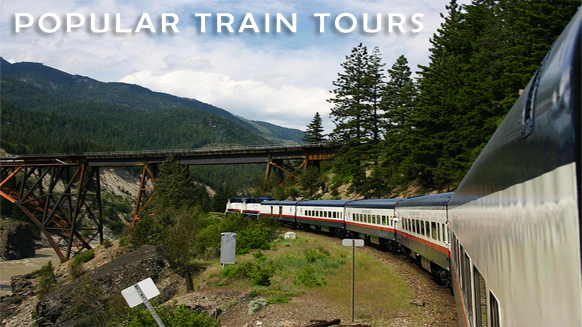 Start your train trip in Vancouver, Whistler, Banff, Calgary or Jasper. This trip is perfect if you want to create your own Canadian Rockies travel packages! These prices are lower in April and May. Combining two days on the Rocky Mountaineer from Vancouver to Banff (our most popular route!) with two nights in Banff National Park, this five-night trip is excellent value for someone who wishes get the most out of their Canadian Rockies train trip. Also included is a trip to Lake Louise and a transfer to the Calgary airport–why visit Banff but miss Lake Louise, only 35 miles away? Experience the Canadian Rockies with the Rocky Mountaineer train tour. *GoldLeaf includes GoldLeaf Service on the Rocky Mountaineer and upgraded hotels in Vancouver and the Rockies. This is a BEST VALUE PACKAGE. Made for the Canadian Rockies train-lover! This Canadian Rockies train tour begins and ends in Vancouver. Three days, one night, two trains: the Rocky Mountaineer and the ViaRail Canadian, on a different route each day. Available April 23 – October 1, 2012. Length: 6 Nights/7 Days. *GoldLeaf includes GoldLeaf service on the Rocky Mountaineer and upgraded hotels in Vancouver, Banff, Lake Louise and Jasper. One of our most popular tours! This 6-day package treats you to a night at the Chateau Lake Louise, a motor coach tour of Banff and a glacier helicopter tour. Spend nights in Vancouver, Kamloops, Banff, Lake Louise and Calgary. Available select dates between April 23 and October 1, 2012. Easily modify this package to add a night in Banff or subtract a night in Calgary. *GoldLeaf includes GoldLeaf Service on the Rocky Mountaineer and a lake view room at the Chateau Lake Louise and upgraded hotels in Vancouver, Banff and Calgary. Our most popular tour, this Canadian Rockies train trip has everything: two days on the Rocky Mountaineer, seven nights accommodation, a night in Vancouver, a night in Kamloops, two nights in Jasper, a night at the Chateau Lake Louise, a night in Banff and a night in Calgary. This trip also includes tours of Jasper, the Columbia Icefield, Yoho National Park, and the Banff Gondola.